Pes anserinus is a generally used term that is applied in order to explain attachments of partially linked, flattened tendons; specifically, the sartorius, gracilis, along with semitendinosus. These particular tendons are attached on the medial side of the upper tibia region. A bursa generally located deep inside the pes anserinus is named as the bursa anserinus. 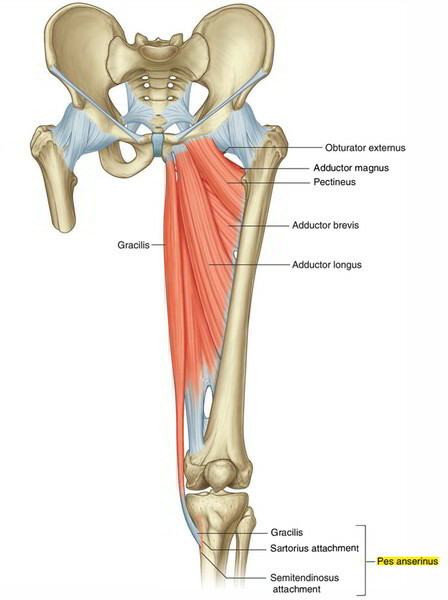 The gracilis along with semitendinosus tendons are comparatively thick, strong, and also cordlike, while the sartorius tendon is almost fascial in form in this system. This bursa is often called subsartorial bursa as well as pes anserinus bursa and is located under the pes anserine tendon, which is the attached tendon of the sartorius, gracilis, as well as semitendinous muscles over the medial aspect of the tibia. The pes anserine bursa is vulnerable to the formation of swelling created by excessive use, misuse, or straight injury. Calcification might occur, if swelling of the pes anserine bursa ends up being chronic. The pes anserine bursa gets infected in rare situations. This bursa can present as a singular bursal sac or, within a few patients as a multi-segmented series of lobulated sacs. The bursa is subject to the generation of swelling as a result of excessive use, misuse, or direct injury. The medial collateral ligament in many cases is also related in case the medial knee has undergone trauma. The medial collateral ligament is a wide, flat, band-like ligament which ranges from the medial condyle of the femur to the medial side of the shaft of the tibia, the place where it links just superior to the notch of the semimembranosus muscle. It also connects to the edge of the medial semilunar cartilage. The medial collateral ligament is intercrossed on its lower part by tendons of the sartorius, gracilis, and semitendinosus muscles. Individuals with pes anserinus bursitis suffer from pain over the medial knee joint as well as enhanced pain at passive valgus as well as external rotation of the knee. The pain is continuous and often the individual is not able to kneel as well as walk down stairs. The pain might disrupt sleep. Activities, particularly involving flexion along with outer rotation of the knee, makes the pain even worse whereas rest and heat give some comfort. Coexistent bursitis, tendinitis, arthritis, or internal trauma of the knee can mislead the clinical picture right after trauma to the knee joint. If the swelling of the pes anserinus bursa ends up being chronic, calcification of the bursa might develop. Often the medial collateral ligament also is related if the patient has endured damage to the medial knee joint. Non – steroidal Anti-Inflammatory Drugs (NSAIDS). Patients should be recommended to stay away from the recurring actions behind the development of this painful disorder. For patients who do not act in response to these treatment techniques. Injection of the coronary pes anserine bursa along with a local anesthetic and steroid can be used. The major drawback of this hypodermic injection method is infection, which should be extremely rare if precise sterile method is followed. After injection of the pes anserinus bursa of the knee around 25% of patients mention a momentary growth in pain; the patient should be informed about this.